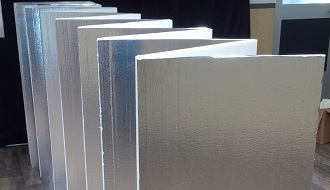 R-More 450 comes in thicknesses of 3/8" and 1/2" in sealed packaging of 4' x 50' units. The fan-fold comes with 25-2' x 4' panels attached to one another with a high tensile strength polypropylene web. Each panel is laminated with a choice of three tough film facers that make it durable and water resistant. R-More 450 is designed to lay flat during installation and like R-More 472 it will help prevent R-Value loss and give you an additional 2.08 R in doing so.